Regenerating Body Moisturizer supports the skin’s natural regenerative functions, balancing moisture content and making skin feel smooth, firm and supple. Formulation: Jojoba oil and candelilla wax hydrate while red clover, horsetail and birch leaves offer antioxidant properties and support the skin’s natural powers of renewal. Marsh mallow provides moisture-balancing support. The scent of rose and orange essential oils mix with soft vanilla notes to delight the senses. Apply after showering, bathing, sports or sauna. 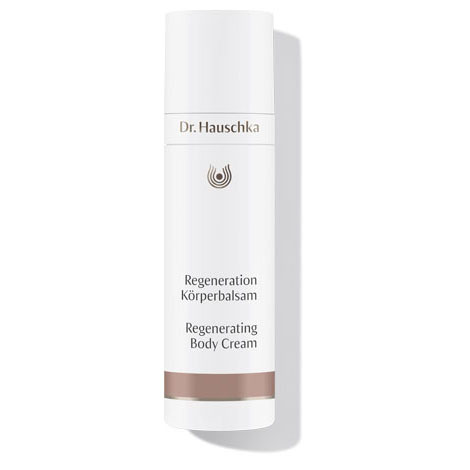 Regenerating Body Moisturizer is quickly absorbed and provides longlasting, intensive nourishment and care. Water (Aqua), Simmondsia Chinensis (Jojoba) Seed Oil, Prunus Amygdalus Dulcis (Sweet Almond) Oil, Alcohol, Helianthus Annuus (Sunflower) Seed Oil, Sesamum Indicum (Sesame) Seed Oil, Rosa Damascena Flower Extract, Equisetum Arvense Extract, Betula Alba Leaf Extract, Rosa Damascena Flower Water, Glyceryl Stearate Citrate, Glycerin, Hectorite, Fragrance (Parfum)*, Althaea Officinalis Leaf Extract, Punica Granatum Fruit Extract, Lysolecithin, Sucrose Laurate, Limonene*, Linalool*, Geraniol*, Citronellol*, Coumarin*, Citral*, Benzyl Benzoate*, Farnesol*, Benzyl Salicylate*, Eugenol*, Trifolium Pratense (Clover) Extract, Euphorbia Cerifera (Candelilla) Wax, Xanthan Gum, Lecithin, Malpighia Punicifolia (Acerola) Fruit Extract. Regenerating Neck and Décolleté Cream provides optimum skin care for your décolletage with the targeted reduction of wrinkles caused by dryness.